The Dry Weight/Volume Converter converts between dry weight (mass) and dry volume for a number of common winemaking additives. This calculator is intended mainly for home winemakers who don't have accurate scales, and instead add ingredients on the basis of dry volumes (teaspoons, mL, etc.). Additive – The additive for which the conversion is being made. Select from the long list of common (and not-so-common) additives. Dry Weight – The dry weight (mass) of the additive. This field can be either an input field or an output field. If it is used as an input field, the dry volume is calculated from the entered value. Dry Volume – The approximate dry volume of the additive. This field can be either an input field or an output field. If it is used as an input field, the dry weight (mass) is calculated from the entered value. All of the conversion factors are based on Jack Keller's "Measuring Additives in Winemaking", except for the sugar and sodium metabisulfite conversions which are based on my own measurements. Please be aware that these conversions are approximate. The Stock Solution Formulation Calculator determines the amount of an additive required to yield a stock solution with a given volume and concentration. Target Concentration – The desired concentration of the additive in the stock solution. Solution Volume – The volume of the stock solution being made. Mass of Additive Required – The mass of the additive required to yield the desired concentration of the additive in the specified volume of stock solution. The Inverse Stock Solution Makeup Calculator determines the amount of an additive required to yield a stock solution such that a specific volume of the solution will result in a desired increase in concentration of the additive in a specific volume of wine. Total Solution Volume – The total volume of the stock solution being made. Wine Volume – The volume of wine being treated. Volume of Solution Added – The volume of stock solution to be added to the wine. Total Dosage – The desired increase in concentration of the additive in the given volume of wine. Mass of Additive Required – The mass of the additive required to make the given volume of stock solution. This calculation determines the amount of a substance required to yield a stock solution such that a specific volume of the solution will result in a specific increase in concentration in a specific volume of wine, as described by Ben Rotter (2008). The Miscellaneous Additions Calculator determines the amount of an additive to add to a wine to yield a desired concentration in the wine, given the initial concentration of the additive and volume of the wine. The additive can either be in the form of a solid (powder or crystals) or a liquid (stock solution). Additive Type – Select from either solid (powder/crystals) or liquid (stock solution). Solution Concentration – The concentration of the additive in the stock solution being added. Required only if liquid (stock solution) was selected as the additive type. Target Concentration – The desired concentration of the additive. Initial Concentration – The current concentration of the additive. Wine Volume – The volume of the wine being treated. Mass of Additive Required – The mass of the additive required to yield the desired concentration in the specified volume of wine. Reported only if solid (powder/crystals) was selected as the additive type. Volume of Solution Required – The volume of stock solution required to yield the desired concentration in the specified volume of wine. Reported only if liquid (stock solution) was selected as the additive type. This calculation determines the amount of a substance to add to a wine to yield a desired concentration in the wine, given the initial concentration of the substance and the wine volume. The substance can either be in the form of a solid (powder or crystals) or a liquid (stock solution). If it is being added as a liquid, the concentration of the solution must be specified. It is assumed that the volume of the additive is negligible compared to the volume of the wine, and that the increase in volume due to the addition can be ignored. If the volume of the solution addition is greater than 10% of the volume of the wine, FermCalc will issue a warning message. In this case, consider doing a blending calculation to account for the impact of the volume increase on the final concentration. The Yeast Assimilable Nitrogen (YAN) Calculator determines the yeast nutrient additions required to supply the desired YAN level in a must. 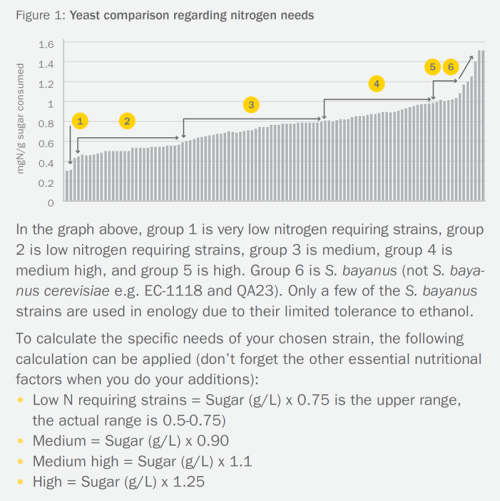 The total YAN requirement is calculated based on the nitrogen requirements of the selected yeast strain and on the initial SG of the must. The required masses of the selected nutrients are then calculated based on their nitrogen contents. The additions can be scheduled in stages, with up to three nutrients added in up to four stages. Number of Nutrients – The number of yeast nutrients to be used over the course of the fermentation. Up to three nutrients can be selected. Number of Stages – The number of staged nutrient additions to be used. Up to four stages can be used. Yeast – The yeast strain to be used. If your yeast strain is not listed, select from one of the three generic entries at the top of the list. Nutrient (1, 2, 3) – The yeast nutrients to be used in the various stages. Fermaid O Efficiency Factor – The organic nitrogen in Fermaid O is reportedly utilized by the yeast 3 to 4 times more efficiently than nitrogen in other nutrients. This factor allows the user to account for this enhanced efficiency. It is generally set to a value of 3, and is increased to a value of 4 if GoFerm is used during yeast rehydration. Set it to a value of 1 if you want to ignore it. Must Volume – The volume of the must being treated. Yeast Multiplier – The factor in mgN/g sugar that is multiplied by the sugar content of the must to calculate the total YAN required. This is initially determined from the yeast strain selected above, but it can be overridden by the user. A range is not enforced, but it should be in the range from 0.5 to 1.5. Total YAN Required – The total YAN requirements over the course of the fermentation. This is calculated based on the yeast strain and the must SG, but it can be overridden by the user. Initial Must YAN Level – The estimated initial YAN concentration of the must, prior to the addition of any nutrients. This needs to be estimated by the user. Relative Mass or YAN Contribution at Each Stage – The relative mass or YAN contribution for each nutrient at each stage. These values determine the mass or YAN allocation between the specified nutrients, as well as the allocation of each nutrient between the stages. The proportional contribution for a given nutrient at a given stage will be the value entered in the corresponding field divided by the sum of the values in all of the fields. These fields are required only if either the number of nutrients or the number of stages are greater than one. YAN Deficiency – The amount of YAN that needs to be supplied by the added nutrients, which is simply the difference between the total YAN required and the initial must YAN level. Mass to Add – The mass of each nutrient at each stage needed to supply the total YAN requirements. Addition Rate – The calculated mass per unit volume of each nutrient at each stage. This allows the user to compare the calculated addition rates to those recommended by the manufacturer or to any legal maximums. The table below compares the results of equation (10) for values of y of 0.90 and 1.25 to the recommended YAN levels of Bisson and Butzke (2000), which are cited frequently on other web sites. It can be seen that the Bisson and Butzke recommendations generally fall between the Scott Labs medium and high recommendations. FermCalc gives the user the ability to override the yeast multiplier and/or the calculated YAN requirement. Nutrient requirements for some other yeast strains not listed above are provided by Pambianchi, both in his book Techniques in Home Winemaking (2008) and online here. The Pambianchi relative nutrient requirements scale appears to be somewhat different from that of Scott Labs, as shown in the table below for several Lalvin yeasts. These differences should be taken into account when deciding on multipliers for other yeasts. Yeast nutrient nitrogen contents are listed below. This list includes only those nutrients which should be added directly to the fermenter, and does not include yeast rehydration nutrients. Many of the listed nutrients contain DAP and/or thiamine. The Alcohol and Tobacco Tax and Trade Bureau (TTB) sets the maximum legal addition rate for DAP at 8 lbs. per 1000 gals. (0.96 g/L), and for thiamine at 0.005 lb/1000 gals. (0.6 mg/L). FermCalc does not enforce any limits, so it is up to the user to ensure that the nutrient additions comply with the limits set by the TTB and by the manufacturer. For more information about nutrient additions, see Travis Blount-Elliott's white paper.